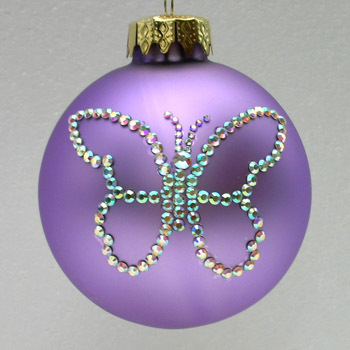 Presenting a butterfly Christmas tree ornament with authentic Swarovski rhinestones. Butterfly Christmas tree ornaments with authentic aurora borealis Swarovski crystals can be purchased at Designer Ornaments. Butterfly Christmas tree ornaments depicting a butterfly can be purchased at Designer Ornaments.